Our MAD about carpets guarantee! We’re MAD about carpets, and so is our guarantee! When you choose to hire The Carpet Chemist for your carpet stretching needs, you can rest assured the job will be performed in the most timely and professional manner and proper carpet stretching procedures are used per the IICRC industry standard. If there are ever any issues with loose carpet after we have done our job, we back it up 100% for the entire life of the carpet. Occurrences such as delaminated carpet and flood damage are exceptions. We want you to know that you can feel confident in choosing the right carpet stretching company for your Louisville home, so we stand behind our work forever. Don’t replace it. Re-stretch it! When carpet is buckled, wavy or loose, it becomes an unsightly tripping hazard. Carpet that isn’t properly stretched also deteriorates quicker, leading to premature replacement. Before you search for new flooring, call Carpet Chemist at (800) 515-1342. Our team of certified professionals is skilled in carpet repair, cleaning and restoration. The ripples in your carpet are one of the most common issues we see, and the solution is easy: high-caliber, professional carpet stretching done per the industry standard. With surprisingly modest time and expense, the Carpet Chemist re-stretches your carpets, ensuring they are properly secured while vanquishing worrisome wrinkles. Our Louisville, KY carpet stretching service delivers years of wear and enjoyment, allowing you to put off costly floor covering replacement. To see how effective and attractive Carpet Chemist professional stretching can be, view our gallery. When you need carpet stretching, repair, cleaning or re-dyeing services in Louisville, KY rely on Carpet Chemist to reinvent your flooring. Using a scientific approach and the industry’s latest dyeing techniques, we provide guaranteed workmanship that delivers 100% satisfaction. Certified in carpet dyeing, color restoration and color repair, the Carpet Chemist team puts a beautiful, new face on ugly carpet. Get started now: Request a free carpet repair estimate online or call (800) 515-1342 to schedule carpet stretching, cleaning and re-dyeing. “I should have had this done years ago. That looks amazing!” is what we hear from our customers who have their carpets re-stretched. Carpet bucking, carpet rippling, carpet waves, bunched up carpet…whatever you call it, people want to know why this happens. And we’re glad to tell you. Carpet installers may get mad at us, DIY carpet cleaning enthusiasts may resent us, but our goal is to educate the marketplace with integrity and professionalism, so by gum I’m gonna spill the beans. Improper Installation When most carpet installers install new carpet, they generally use a tool called a knee kicker. They’ll unroll the fresh roll of carpet, flap it and pull it around the room until it’s just right, then begin what would appear to be an excruciating torture on one’s knees, and start ramming their knee into this knee kicker tool, all the way down the walls until the obvious wrinkles are gone. Then it’s time to tuck the carpet into the gully and cut off any excess around the baseboards. The problem with this is, even though most carpet installers use this technique, it is improper. A highly trained professional knows that carpet must be drum tight when installed, or it will ripple up once furniture is placed on top of it and scooted around the room. 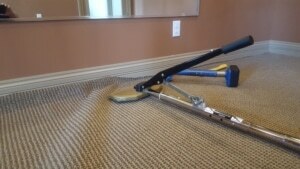 The proper way to install carpet is by utilizing a tool called a carpet power stretcher, which is an adjustable tool that extends to the length and width of the room. The power stretcher must stretch the entire length and width of the room to ensure the carpet is drum tight. There are no if’s, and’s, or but’s about it. This is the proper way to install carpet. A knee kicker may be used for closet areas, corners, or other hard to reach places, but is certainly not a carpet installation tool. Excessive Moisture is the second leading cause of carpet buckling. What happens is the carpet doesn’t dry fast enough and it leaves it soggy and wet and loose. In many cases such as these, the carpet backing will become delaminated, rendering your nice expensive carpet unfixable. You simply can not re-stretch delaminated carpet. Let me tell you why. Your carpet has 2 backings (that grid patterned shaped hard stuff on the backside of your carpet) with a layer of adhesive in between, holding them together. The carpet backing can be broken by scooting heavy furniture across it, or from excessive moisture. It separated the two carpet backings, which means no matter how much you stretch the carpet, it will not move as one uniform piece. It will always be flimsy and loose and there is nothing you can do about it (unless you get into using a T-nozzle and a carpet glue gun, but that’s only for really small sections). Excessive Heat is another culprit. Not Kentucky or Ohio heat. No, I’m talking Arizona, mid-summer heat. Heat will essentially do the same thing as water and loosen and relax the carpet to the point where it wrinkles. So, there you have it. The top 3 reasons why carpet ripples, buckles, and wrinkles. You also now know more than the average person about proper carpet installation tools and procedures. Give yourself a hand! And remember, we back up our work with a 100% Unlimited Unconditional Lifetime Labor Guarantee! When you call Carpet Chemist at 800.515.1342, you can count on top-quality workmanship that goes beyond the industry standard and delivers proven solutions for an eye-catching, healthy home and carpet. Trained, certified and dependable, we’re your carpet specialist for life. Find out what customers are saying about our cutting-edge process and five-star service! Connect with our team at (800) 515-1342 or by using the secure form below.